Indoor growers are limited by electrical capacity. The amount of HID lights they can run is limited due to sharing the service panel with the buildings other electrical devices. In addition, lights are typically only used for 12 hours a day. In order to utilize the other 12 hours of the day, previously required extra ballasts and power circuits. Flip Flopping the ballasts you already have allows you to double your growing area and increase yields while taking advantage of all 24 hours in a day. This is done by rerouting the output of the ballast by implementing the LF series flip flop. The unit is connected to the ballasts output and gives 2 outputs per ballast to connect lamps to. The output is switched between the 2 lamps by a trigger cable that is connected to an appliance timer or lighting controller. For the past four years, the founders of Horti-Control have experimented with different methods of building flip flop systems. They decided to do this after purchasing other products that claimed to work, but proved unreliable. What these products have in common is the way they were designed, using printed circuit boards (PCB’s) and solid state relays. PCB’s and solid state relays have a major achilles heel. They are prone to failure when used with high voltages. The voltage generated by HID ballasts can and will destroy solid state relays and PCB’s. They are also sensitive to high temperatures and humidity. We found that heavy duty relays are the most reliable way to flip flop HID lights. 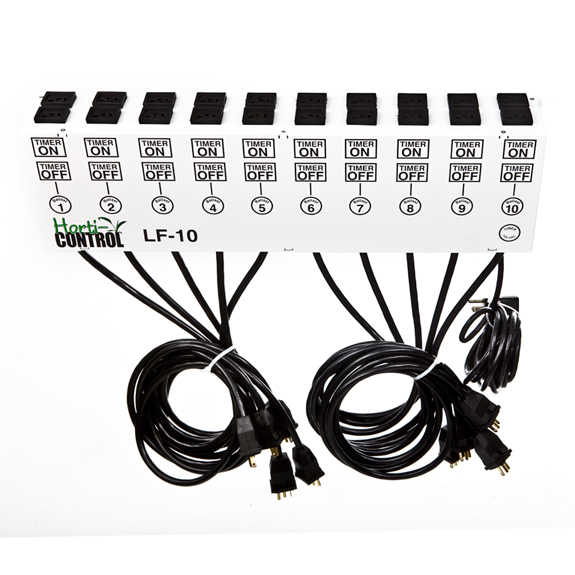 Horti Control’s LF series is purely mechanical and designed to be simple, versatile, and above all, reliable.